Improving upon the same Flicka-inspired cowgirl coming-of-age formula established by the previous 2012 installment that first introduced viewers to the trick-riding Sweethearts of the Rodeo, writer/director Timothy Armstrong returns with a newfound filmmaking confidence and a much stronger character arc for this impressive straight-to-disc Fox studio sequel. Revisiting the same themes, a few supporting characters as well as the clever family mystery plot device served up in the earlier Cowgirls which found its younger heroine running away with the rodeo while on the hunt for the father she’d never met, Dakota’s Summer takes a much more ambitious approach to its older eponymous teenager’s family tree fueled journey of self-discovery. 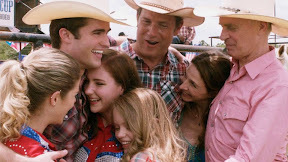 Having always wondered why she didn’t look more like her older, blonde sister (played by Arrow fan-favorite Emily Bett Richards) or had the natural genetic ability of her rodeo legend grandfather Austin Rose (Keith Carradine), shortly into the film, Dakota (Haley Ramm) finally learns the secret that her family has been keeping from her since birth. Still reeling from the shock, Dakota travels to her grandfather’s ranch to process the revelation and do a little Nancy Drew-like digging in the process. Gradually letting her guard down the more time she spends helping out with the running of a miniature horse camp that Austin hosts on his ranch for orphans and troubled tweens, Dakota soon finds an unlikely friend and kindred spirit in a young, mischievous girl named Summer (Jade Pettyjohn) whose love of horses rivals her own. With the lesson that success has more to do with heart than biology, Dakota musters up the courage to literally and figuratively get back on the horse after stumbling in her own life as well as at the rodeo -- rejoining the Sweethearts after the life-changing summer reminds her that what she was looking for she had all along. Handling a contemporary identifiable dilemma with realism as well as maturity, Armstrong deftly tackles difficult terrain involving self-made vs. biological families and the importance of good friends who are there to help play that role when times get tough. Admirably avoiding the easy way out by refusing to treat certain characters like one-dimensional villains or opt for an overly sugar-coated fairy tale approach, Armstrong instead depicts all sides and points-of-view regarding the topic of adoption, therefore ensuring that there will be much for families to discuss together after the movie given his more humanistic treatment of the subject. While obviously because the main storyline is so rich, some of the supporting characters get lost in the shuffle and a few plot points get resolved a bit too conveniently in the nick of time including a disappointingly protracted conclusion to Dakota’s ongoing rivalry with a former childhood friend turned trick-riding antagonist. Yet in the end, Dakota’s Summer is just so darn lovable in its wholesome approach that its minor flaws are easy to overlook. Beautifully transferred to Blu-ray, the film’s visuals radiate the warmth reflected in its title as well as its script. 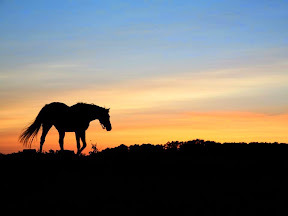 Shot with an emphasis on the bright colors of a golden rayed sunshine, Dakota’s Summer is filled with the same feel-great key-lighting that harks back to the old-fashioned girl and her horse coming-of-age films of decades past from which the series was initially inspired. A superior sequel that easily transcends its dated origins thanks to its intelligent handling of a more contemporary plotline, Dakota’s winning combination of heart and horses keeps the briskly paced girl power film galloping along. Highly recommended, Dakota’s Summer is sure to become a replay-worthy favorite on your daughter’s upcoming summer vacation, thanks to the convenient inclusion of a digital high definition portable device copy of the film with the Blu-ray release that will enable you to bring Austin’s miniature horse camp with you wherever you go (no saddle required).